When the Soo Locks opened in 1855, maritime traffic boomed around the Keweenaw, with immigrant miners and supplies arriving at the growing number of harbors, and huge loads of copper shipped to feed the incessantly hungry furnaces of the industrial cities of on the southern lakes. With this increasing vessel traffic it became quickly apparent that the Huron Island chain represented a significant hazard to vessels making their way along the coast. Marking the turning point for vessels coasting in either direction between the lights of Marquette and Portage River, the islands were surrounded by dangerous shoals, were frequently enshrouded in pea-soup fogs, and had been the site of numerous shipwrecks over the years. Thus, it was no great surprise to mariners when the venerable Captain Miller ran his side-wheeler Arctic and her cargo of passengers, freight and cattle aground on the easternmost island of the chain on May 29, 1860. While the Captain managed to get the passengers, cargo and even the cattle ashore to safety, the vessel was pounded by storm-driven waves, and crushed to kindling over the following days. Newspaper coverage of the loss of the Arctic served to bring the dangerous conditions around the islands to the public’s attention, and the intensity of pleas for a light on the Huron Islands increased in both frequency and fervor. The Lighthouse Board took up the call in its 1863 and 1865 annual reports to Congress, noting that the islands were "a constant source of anxiety to the navigators, wrecks having occurred frequently at this point." Congress responded favorably to the request with a $17,000 appropriation on July 26th, 1866, and the Detroit office immediately dispatched a survey crew to Lake Superior to select a site. The survey crew selected West Huron island, the westernmost of the chain as the best location for the new station. Basically nothing more than an outcropping of convoluted solid granite rock with deep fissures and chasms, the highest point on the island some 163 feet above lake level was chosen as the location for the lighthouse itself. While the site was selected and surveyed that year, it was not until September 2nd of 1887 that a clear title for the property was attained, and being so late in the season, work could not begin at the site until the following navigation season. The lighthouse tender Haze carried a work crew and materials from Detroit, and delivered them on the craggy shore of West Huron Island soon after the opening of navigation in the spring of 1868. The working party’s first order of business being to blast and scrape a road from the rocky shore to the site high atop the cliff, up which the materials and supplies could then be transported. With tons of granite removed, a number of the island’s small birch trees were felled to construct a series of temporary wooden bridges spanning some of the deepest fissures. Plans for the station called for a duplicate of the station being constructed on Granite Island that same year. Built of granite blocks quarried from the islands themselves, the 1 ½-story structure featured an integrated square tower 39 feet in height with a circular inner brick wall containing a set of 55 cast-iron spiral stairs which wound from the first floor to the lantern. With a landing on the second floor, these stairs also served as the only method of moving between the floors within the dwelling. Centered on the square gallery atop the tower, an octagonal cast-iron lantern was installed, and the fixed white Third and-a-half-Order Fresnel lens was assembled atop its’ cast-iron pedestal. By virtue of its location at the highest point on the island, the light boasted a focal plane of 197 feet. With the construction of a privy, oil house, boat dock and tramway, work on the station was completed that fall, with the light exhibited for the first time on the night of October 20, 1868. 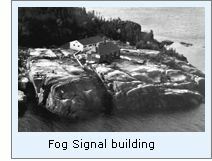 While the Board had been well aware of the fogs which shrouded the islands at the time of the original request, no funds for the construction of a fog-signal building had been included, since finds were available under a general appropriation for fog signals throughout the lighthouse system, and it was planned to tap this fund for the later construction of a fog signal on the island. However, the general appropriation was recalled by the Treasury on July 12, 1870, and without funding the fog signal could not be built. Requested funding was not forthcoming for almost a decade, when funds for construction were finally approved in 1880. Contracts for the materials and equipment were awarded, and construction began in 1881 on a pair of fog signal buildings on the west end of the island, approximately 1,700 feet from the lighthouse. Equipped with duplicate 10-inch steam whistles powered by a pair of coal-fired boilers, the fog signals required a constant and copious volume of water to operate, and since the signal building sat high above the water, the possibility of pumping water up such a vertical lift was out of the question. The island’s solid granite also precluded the drilling of a well. To solve the problem, a dam of boulders and cement was constructed across the open end of one of the many deep fissures near the signal building to form a storage basin for rain and snow melt. However, this arrangement proved unsuccessful, since the dam was demolished by violent sea and ice the following winter, forcing the construction of a separate pump house outfitted with its own steam-powered pump to draw water up the cliff from the lake. 1887 saw the replacement of a stack in one of the signal buildings, improvement and extension of the tramway used to bring coal up the cliff to the signal building, and the installation of a steam-powered derrick for lifting supplies from the water below. This was also the fog signal’s busiest season, as the keepers kept the whistles screaming their warning across Superior for a total of 361 hours. 1890 was also likely memorable for Huron’s keepers as the station’s water supply was broken by ice in the spring, and the lighthouse was struck by lightning in June, tearing-out part of the cornice and damaging one of the building’s side walls. While temporary repairs to this damage were made that year, it was not until the following year that a crew arrived at the island to make more permanent repairs. The lighthouse tender AMARANTH again arrived at the island in June 1898, delivering a work crew, replacement boilers for the station’s worn-out fog-signals, and materials for the construction of a single, larger fog-signal building into which both signals were to be installed. Work on the new signal building continued through the fall, but had to be suspended as winter approached at the close of navigation. Work resumed the following spring, and progressed quickly. While at the station, the work crew replaced stairs on the side of the cliff from the landing, rebuilt the tramway, replaced a door in the tower and made a number of other repairs before loading the old fog signal equipment on the Amaranth, and moving on to other work. The following year, Huron Island’s keepers shoveled 20 tons of coal into the hungry boilers to keep the steam whistles wailing for a total of 300 hours. The dawning of the new century saw continuing changes at the station, with the light’s upgrading from a wick lamp to incandescent oil vapor in 1912. At some time during the 1930’s a diesel-powered generator brought electricity to the station, allowing the electrification of both the dwelling and the light itself, and the subsequent conversion of the fog-signals to compressed-air powered diaphones. With the transfer of responsibility for aids to navigation to the Cast Guard in 1939, a crew of five Coasties took over responsibility for the station. Considering the old keepers dwelling to be too cold and uninhabitable, the Coast Guard built new "barracks-style" quarters near the fog-signal building in 1961, and installed a solar-powered 45,000 candlepower electric oscillating light in the station’s lantern. With the increased use of LORAN, Radar and GPS, the need for the fog-signal was deemed superfluous, and in 1972 the Coast Guard boarded-up the buildings and left the station for the last time, returning only infrequently to perform maintenance on the solar-powered light. Today, the Huron Islands are owned by the US Department of the Interior’s Fish and Wildlife Service, and are part of the Huron Islands Wilderness Area, which is administered by the Seney National Wildlife Refuge. Consisting of a total of 147 acres, the eight islands serve as a protected habitat for a wide variety of birds. Interestingly enough, the easternmost island in the Huron Chain is known to this day as Cattle Island, in memory of the cattle from the Arctic that were marooned there long ago in 1860. 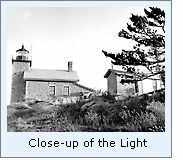 Click here to see a complete listing of all Huron Island Light keepers compiled by Phyllis L. Tag of Great Lakes Lighthouse Research. We have yet to visit this light, and it is doubtful that we will be able to arrange to do so for some time. If any of our visitors have recent photographs of this station that they would like to share, please contact us. Concerned for the fate of the deteriorating lighthouse structures, a number of local citizens formed the non-profit Huron Island Lighthouse Preservation Association in January of 1999, with their stated purpose being "preserving the historical and architectural features of the lighthouse and adjacent properties for future generations." Since The Huron Islands are located offshore in some treacherous waters, and surrounded by shoals, only those with appropriate vessels, experience and navigation equipment should attempt approaching these islands. Uncle Ducky Charters out of Marquette offer trips to the Hurons with qualified Captains. Annual report of the Lighthouse Board, 1863 - 1912. Great Lakes Light List, Department of Commerce, 1924. Great Lakes Light List, USCG, 1953. Annual report of the Lake Carriers Association, 1912. Images from the Michigan State Archives. US Coast Guard Historian's office. Great Lakes Coast Pilot, 2000.